Thank you for considering us to be your dentist! We are a high end dental office that specializes in general, cosmetic, preventative, and laser dentistry. Our dentists, Dr. Phillips and Dr. Bernhauser are both extremely gentle, highly qualified, and excited to welcome you to our practice. 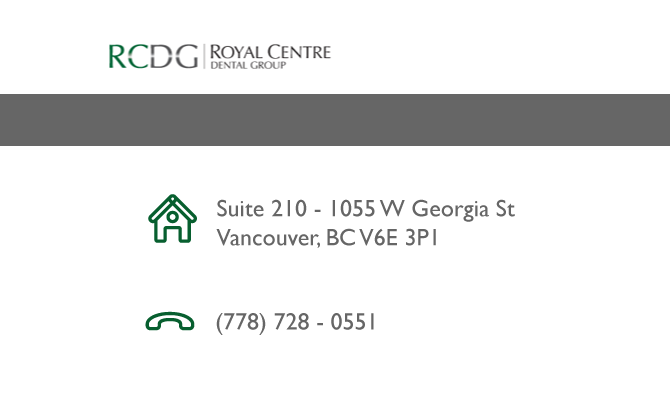 Dr. Ken Phillips is the owner, and principle dentist, at Royal Centre Dental Group. Originally from Montreal, he graduated from Dalhousie Dental School in 1987, eventually moving west. He founded the Royal Centre practice in 1990. Now, when he’s not cycling the highways and byways of the province, or studying the latest developments in dentistry, he can be found here in Vancouver working Monday-Thursday with his long time staff. Dr. Phillips has taken a particular interest in aesthetic and laser dentistry over the years, taking advanced training courses in a variety of areas. He has been mentored by oral surgeon Dr. Ken Blankstein, and now performs most of his own surgical extractions. So that he can meet the growing needs of his patient/clients, Dr. Phillips now has three hygienists on staff and has taken on an associate, who performs some of the procedures he, himself doesn’t, including invisalign.